One day @ a time: Det-ohX.. the alcohol antidote! I have a new product idea. I think this one has the potential of becoming the greatest idea of this century. Well, it might not be as exciting as the Viagra or that fuel cell which can generate electricity out of even the sweat under your armpits; and probably not as clever as selling plain water in bottles or the silicon implants. But it just might share the same status as the iPhone or the Big Mac in terms of convenience. So, the idea is to develop and sell the perfect antidote to alcohol intoxication. Imagine you having a few drinks at the bar, enjoying the feeling for a while with your friends by throwing peanuts at the bartender, and then when it is time to go home drinking a magic potion which instantly gets the high off you! You become as sober as an Orang Utan in a minute, and you can drive back home without worrying about the cops, or even worse, your spouse who waits at the doorstep with a breathalyzer. How cool is that? I don't think the liquor companies mind a bit about the idea. This will only increase their revenue as more and more people would be willing to indulge now. It is actually the fear of imprisonment (police station or home) that prevents most of the people from having a good time every evening. A little bribe can make the government to pass a law, making it compulsory for everyone to buy the antidote along with alcohol. The benefits doesn't end there.. it is actually a win win situation for everyone at large. The liquor companies can make a lot more money by selling more liquor or manufacture the antidote themselves and have an alternate revenue source. Even the 'mineral' water manufacturers can think of diversifying. The restaurants and bars can remain open all night and serve the hungry public round the clock. The police need not frequent the pubs to ensure that they all close down by 6 in the evening. The government can save a lot of money by taking the police force off the sniffing job, and employ them for tasks they were originally meant for.. like buying groceries for the politicians. The age limit for drinking can now be officially relaxed, as we no longer need to fear the 80-somethings getting drunk and becoming bad examples for the younger generation. Also we need not demarcate drinking as an afternoon activity, for fear of being thrown out of the office or classroom. Can't you imagine the happy society we are visualizing here! The product development is not a difficult thing at all. We all know that it is the '-OH' radical in the alcohols that make us do all the funny things. So the plan is simple, kick out all these '-OH' radicals from the blood and we will just be fine. And we have also learned in our Chemistry classes that alcohol when mixed with acid produces salt and water.. both of them perfectly harmless compunds. So the antidote, in layman's language, will be a diluted acid.. laced with some dried fish or ice cream for flavor! 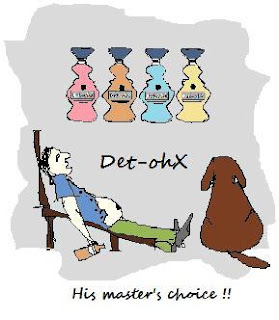 I thought of a nice name for the product as well "Det-ohX" (pronounced as detox); where the '-OH' stands for the alcohol and the 'X' stands for the kind of acid used. So depending on the kind of salt deficiency you have, you can either choose a Sulfuric acid based Det-ohX or Hydrochloric acid based one. I know there will be some resistance to the idea from the companies that manufacture those breathalyzers. But with some slight modifications they can still be used to identify people with bad breath. They are much worse to interact with, than the drunkards. The toothpaste companies will line up behind the cause with some motivation and some projections on tooth paste sales figures through mobile police units. And then there are the policemen themselves, who make decent money now a days from the unfortunate mathematicians who drink and derive. But I am sure the idea of selling cartons of toothpaste in the grey market will soon appeal to them as a better alternative to poking their nose into every john's mouth. Overall, I have a pretty good feeling about this whole idea. But then, I had the same feeling about a number of other things as well, which never worked. But, what if some cash rich venture capitalist read this post by chance, while searching for Viagra online?